The 1942 Memphis football team was the largest in the school’s history at the time with 56 players, but due to the draft lost team members throughout the season, contributing to its 2-7 record. 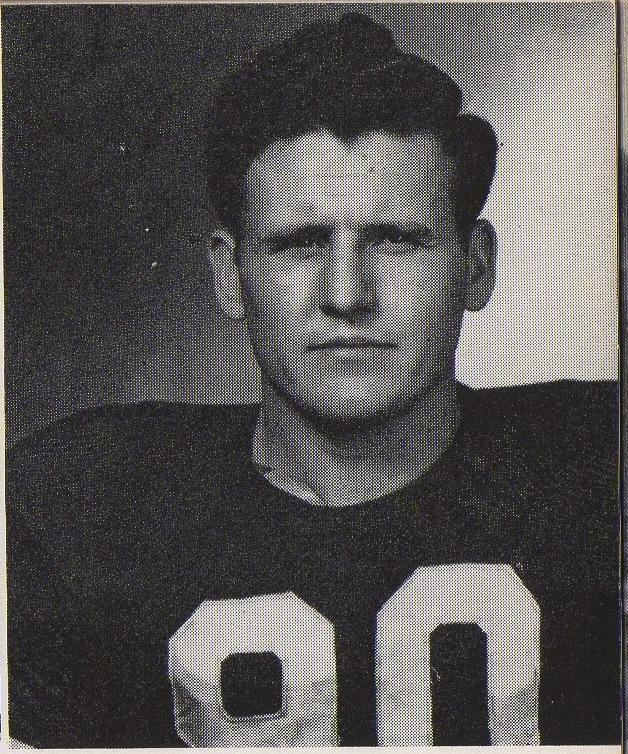 Fred Medling’s 1949 football photo during his return to Memphis State after World War II. 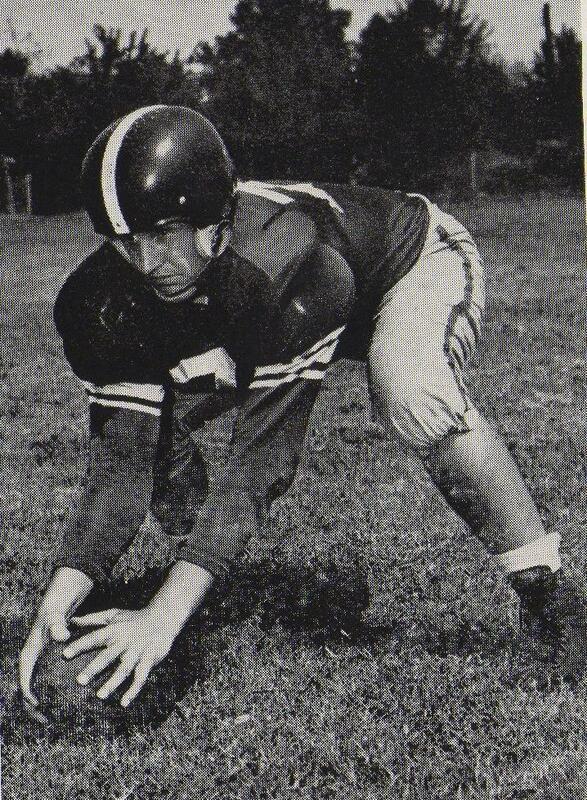 A photo of Fred Medling during his 1948 football season. A press clipping about Robert Humphreys. 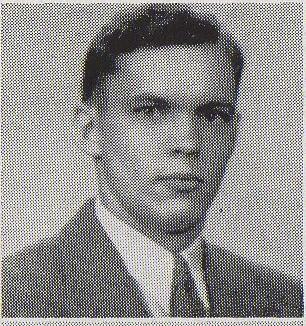 Robert Humphreys yearbook photo from his freshman year at Memphis State. On Sept. 24, 1942, at halftime of the season opener, more than half of the remaining players on the Memphis State football team joined the Marine Corps Reserve. Major Stephen F. Drew administered the oath to the players during the swearing-in ceremony. 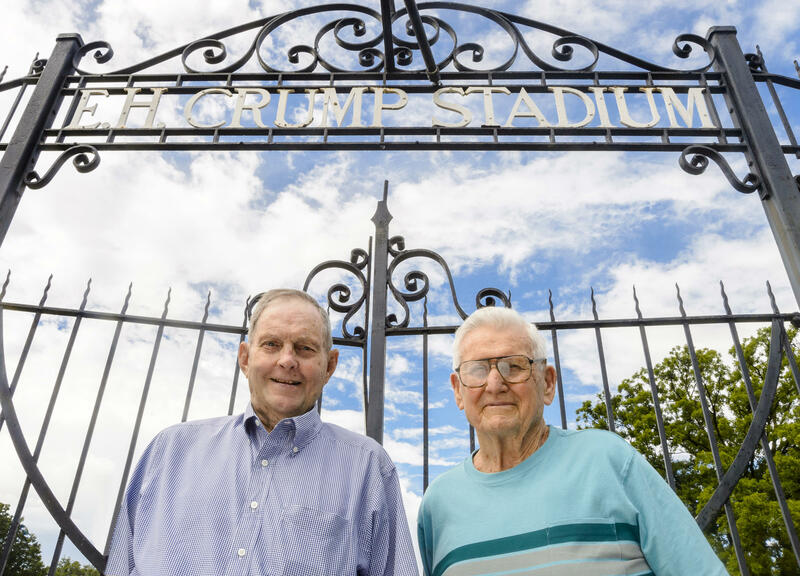 Robert Humphreys (left) and Fred Medling, outside E.H. Crump Stadium, on August 31, 2013. The stadium was the site of the mass swearing-in ceremony by the 1942 Memphis State football team. For a pair of next door neighbors in Collierville, the start of the University of Memphis football season revives memories of 1942, when players went from the sidelines to the front lines. There is a tradition of likening football to war, and in a dramatic season opener, the 1942 University of Memphis football team combined the two. That moment shaped the lives of freshmen Fred Medling and Robert Humphreys, who are the definition of BFFs: best friends forever. The pair have been next-door neighbors for more than six decades. The 89-year-olds still mow their yards and tend to their crops. The self-described country guys are athletic. And athleticism was part of what brought them together, in 1942, when they met as freshman football players at then Memphis State College. They arrived on campus early for a two-week practice before classes started. Those first weeks of practice were grueling. With 56 players, the football team was the largest in the school’s history at the time. That is until Uncle Sam needed soldiers for World War II. The draft decimated the team. At halftime of the season opener on Sept. 24, more than half of the remaining team -- 22 players -- stood on the field at E.H. Crump Stadium and en masse joined the Marine Corps Reserve. Fans cheered the patriotic swearing-in ceremony, which was organized by the coaches. Humphreys was among the new inductees. Humphreys said all of the freshmen joined. All except Medling. Medling wanted to follow his brother into the Army, so he waited to be drafted. The team finished the season with a 2-7 record. It was the last team until the war was over. Football resumed in 1947. Besides the continual loss of players, the team struggled with limited financial and equipment resources due to the wartime draft. Nearby Rhodes College had already abandoned its football program and other schools would soon follow. Humphreys and Medling both finished the school year, but soon, duty called. Neither ended up in the military branch they intended. Humphreys left the reserves and joined the Merchant Marines. And Medling was spotted by a Navy recruiter who saw the makings of a sailor. Medling was commissioned on the USS Devilfish. It was the only submarine known to have survived a kamikaze attack and was featured on “Ripley’s Believe It or Not,” according to Medling. While Medling saw action beneath the waves in the Pacific, Humphreys watched it on the surface in the Atlantic. He witnessed a two-man submarine ram a nearby Merchant Marine ship laden with ammunition. Both men served until the war ended, and then returned to school. Humphreys attended the University of Tennessee, but declined a football offer to focus on his agriculture degree. Medling returned to Memphis State, where he again played football and earned a physical education degree. He soon moved to Collierville, where Humphreys was already living. In 1951, the pair reunited as neighbors for the first time since their playing days. It’s where they’ve been ever since. Now, with children and grandchildren, both have fond memories of their sole football season together. One of their favorite war stories is actually a trouncing by the Baptist-affiliated Union University. “Ah, that was the good old days,” said Medling. Now, as the Memphis Tigers prepare to take the field, the last remaining members of the 1942 football team prepare to take their positions: rooting for the next generation. Thanks to the Special Collections, University of Memphis Libraries for the President Roosevelt clip from their Marvin Bensman Radio Archive.